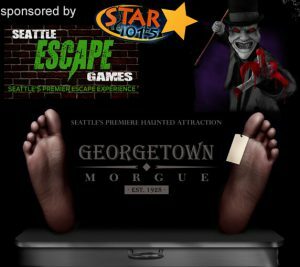 Georgetown Morgue is a Haunted Attraction located in Seattle, WA. The Georgetown Morgue of Seattle is a facility for tragic stories of death. The morgue has a history of thousands of funeral preparations, cremations, and the processing of animal carcasses. The morgue holds what is considered to be the most horrifying unsolved crime in Seattle history. Nine of their staff were forced into the crematorium chamber. There were no surviving witnesses, nor were suspects ever identified. Upon delving deeper into the bowels of the Georgetown Morgue earlier this year, We unearthed a terrifying secret buried far beneath the blood splattered floor boards. Come take a tour and see what our Janitor’s Rigger and Mortis have been hiding all these years. Wonder below at your own risk to see if you can escape the body strewn sewers and private janitorial quarters of the Georgetown Morgue.